Every month, online casino industry witnesses hundreds of new casino sites that claim to offer best online casino entertainment to players. However, only a few of them actually live up to the promises they made to players and critics. One of those few sites is Heart of Casino which literally brings a heart of casino world. 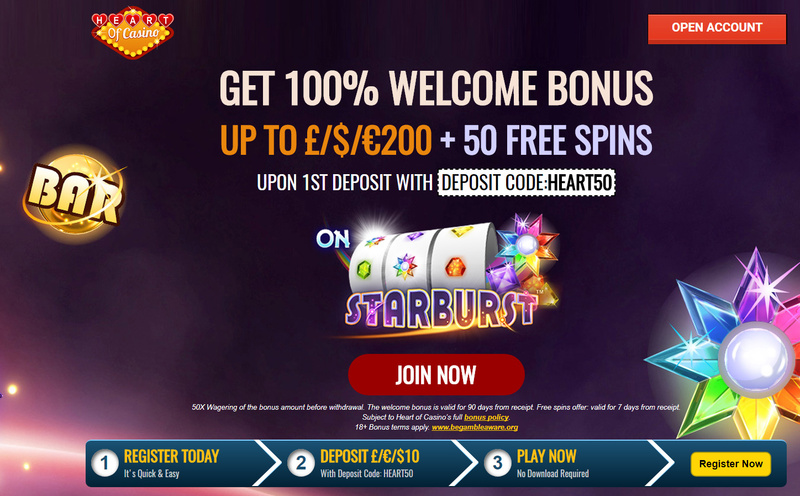 The site truly justifies it’s name by bringing heartfelt offers, mouth-watering bonuses, rewarding promotions and adrenaline pumping online games. The site is brought to you by a very popular online gaming network, ProgressPlay Limited and is licensed by the UK Gambling Commission in order to offer safe, reliable and highly secure online casino entertainment to players. The site caters to all kinds of players including avid wagerers, free gamers and jackpot lovers. Players will find wide range of games, promotions and offers at the site. It acts as a one stop portal for all online gaming requirements of players. Under one roof, players will get to play the best games and promotions without going here and there. Heart of Casino offers a very enticing range of bonus packages which starts right after successful signup process. Newbies will be rewarded with over 100% bonus on making a first deposit and get handsome match bonus on all future deposits. To continue the hefty payouts and lucrative bonus spree, the site also brings an impressive range of promotions. Here players can double up the fun and rewards by simply participating in interesting range of promotions including Autumn Gold! It’s Slots Time, Monday Madness, Twice Wicked, Weekly Surprise, Wednesday Wildfire, Happy Hour and Live Dealer Cashback promotions. Every single promotion features engaging concept and thrilling game play. With quality graphics, high end software and user-interface, all promotions look incredibly spectacular. Those who love to wager a lot can participate in VIP Club to redeem their loyalty points for instant money. The VIP scheme has different levels such as Bronze, Silver, Gold, Platinum and Diamond. Avid wagerers can also participate in big jackpot games such as Divine Fortune, Treasure Nile, King Cashalot, Fruit Fiesta 5 Reel and many more likewise. Heart of Casino also has a widest range of online games to satisfy players’ expectations. The game lobby consists of slot machines, casino games, table games, scratch cards, Live Casino games, mobile games, instant winning games, jackpot games and casual games. With so many games to play with, players will never get bored while playing at the site. To ensure non-stop mobile gaming experience on the go, the site offers hi-tech mobile games powered by technology driven software. One can easily enjoy playing his favorite game on mobile anywhere and at anytime. On top of that, every chat rooms is is backed by a team of experienced chat moderators which is capable enough to give you instant solution on withdrawals, deposits and other game related issues to them. One just needs to contact the moderator in order to get best advice, suggestions and solutions to the problems. Android – Presently Heart of Casino does not provide an alternative way of download an app to your android phone.